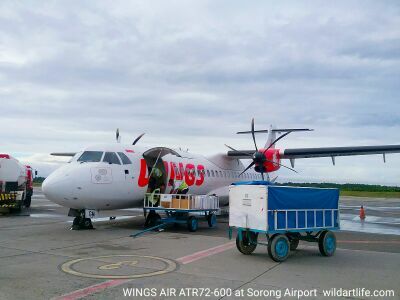 This is a turboprop airplane ATR 72-600 operated by Wings Air. It carries passengers between small towns that have short runways and biggers cities that have longer runways. The passenger carrying capacity of the aircraft is 74 to 78 people with maximum flight distance of up to ... miles. Four seats are configured on every row with a single aisle in the middle of the plane. 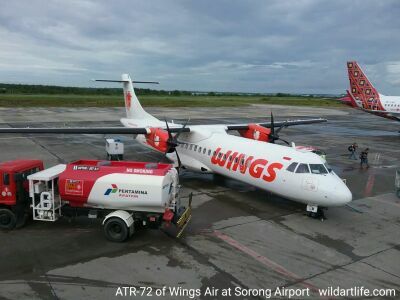 ATR 72 is manufactured in France. This airplane can take off and land on short runways. That's why it is suitable for small airports. Although its speed is lower than jet plane, turboprop airplane spends less fuel. It is a favorable choice for regional flights. In jet planes, luggages are stored in separate compartment. However, based on the photograph, we can see that the cargo or luggages are put in a separate compartment in front of the passenger cabin. Aircrafts that are comparable to ATR 72 include Bombardier Q400 and the Ilyushin 114. Indonesia also prepares R80 that is able to carry 80 passengers. The country has got 18,000 islands and is really in need of such airliner.